Never Spill Your Wine or deal with sand in your food Again! The Summer Picnic Table range was designed and created in 2014 by the crew from La Lucie Recycled, based on the Gold Coast, Australia. Each table is carefully handcrafted, hand-painted and finished with 2 coats of varnish to help protect it, as such each table is unique and one-of-a kind. Our Summer Picnic Tables range are available to order from this website or at our selected stockists. 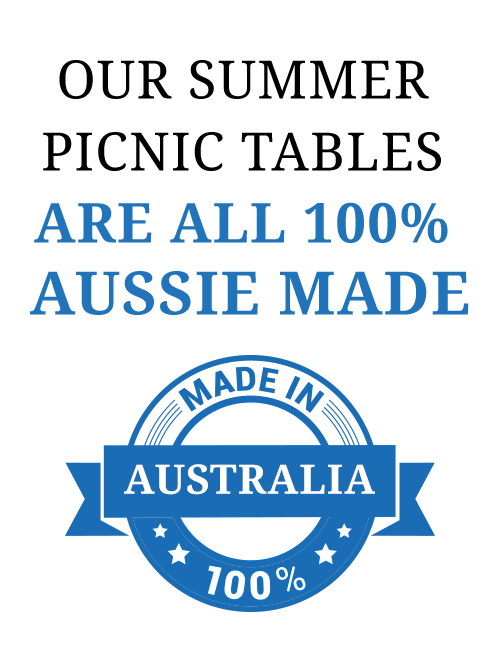 Australia-wide delivery for a flat rate of $15. Note: When available, Summer Picnic tables made from sustainably grown Australian and New Zealand plantation pine, produced and certified to AS/NZS 2269 and AS 6669. 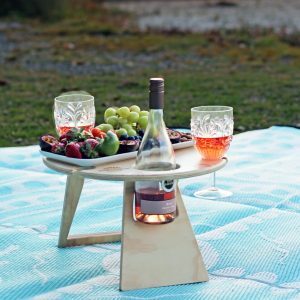 The Original folding wine tables are very popular with those who love Boating, Camping or weekends away in the Caravan. They are portable, lightweight and fold away to practically nothing. The Summer Picnic Table range come in 3 different sizes and over 4 beautiful colours. Each table has wine glass cutouts to keep glasses from spilling, a bottle holder to keep it upright and safe AND enough room for a plate of food… all safe and off the ground. The legs neatly fold under so when you’re finished using it, simply wipe it down, just close the legs down and pop it away away from direct sunlight or moisture. 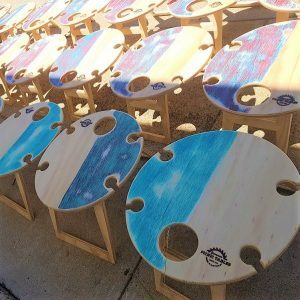 These folding picnic tables are a perfect gift for that ‘impossible person who has everything’ and a favorite for Couples. There are so many practical uses for it. It’s not only limited to wine drinkers, a spilled beer is just as frustrating! The range are often used as a center piece on your dining table to hold nibbles, bottle and glasses. It’s perfect for a kids play-date to keep food away from insects and off the ground. An ideal safe place for keys and mobile phones or to keep portable speakers out of harms way or a perfect pop-up table for children to play on.